I became a member in 2017 having joined TVME on their club stand at the Romsey Show in 2016. The Autobyk has a 2-speed gear box. The gear change is on the top of the fuel tank and has a hand throttle. The rear brake is a back pedalling mechanism. It is not an easy bike to ride, but great fun! The car is a 1968 Ford Mustang Coupe, which I bought when I was working out in California. It is my first and only Classic car. Though many of the cars that I have owned in the past would now be ‘Classics’, if it were not for the tendency for steel to turn back to Iron Oxide. I became a classic owner rather late in life, age 52 to be precise, so why did I do it? I had some friends who owned classic Triumphs, and I had done some ‘runs’ with them. The social side of owning a classic was appealing, more so than the skinned knuckles and the smell of WD40. The second reason was more pragmatic. I needed to drive across the US to see my son in Boston, so why not do it in style. I saw the car in ‘Mustang Ranch’ no not the brothel in Nevada, but part of Fresno Valley Classic Cars, and it was love at first sight. That was back in 1997 and we have been together ever since. Parted only when I left it on the dockside in New Jersey, keys in the ignition, to fly back home. To be reunited two weeks later at Southampton docks. After 18 years of British weather, signs of rust were beginning to show on its nether regions. The engine had, apart from oil filters and spark plugs, remained untouched. It was time for the car to have a serious refit. The body was stripped back to bare metal. The man at Bodytech said in a throwaway comment, 'what colour would you like it?'. In for a penny, in for many pounds I said red! Metallic red replaced metallic blue. Little did I know how many metallic reds there are, each with their own subtle differences. For weeks I couldn't see a red car on the road without wondering what colour it was. In petrol stations and in car parks I asked drivers of cars that sported possible metallic red hues 'what colour is that?'. In the end I choose a Chevy colour. You can see from this I am not a purist. The engine was completely rebuilt. Each change seemed to lead to another. A cracked exhaust manifold and the change to steel header pipes. These interfered with the original power steering box. An upgraded Borgeson power steering box solved the problem. Just keep dipping into the kid's inheritance. They will understand I told myself. Was it worth it? In cash terms probably not, but it looks good, sounds great and steers better. A trip around the Alps this summer will be its proving run. After all these years I still have a big smile on my face whenever I take it out on the road. I have always been a bit troubled by the term “classic cars” as I really do not think I own one. Although all of our vehicles are well over 20 years old (even the “modern”) they are still just old cars to us. However, it is a well-understood if somewhat undefined term so it will have to do. I grew up in (cough) the 1960s which was a wonderful period to be a young enthusiast. All of the new stuff got right up Grandpa’s nose but I loved seeing gleaming P6 Rovers, gaudy Super Minxes and exotic Lancias all over the place. Not only that, but there were still plenty of Aero Morgans and T type Midgets and pre-war family saloons grinding around. Even our sleepy village had hidden gems like a Citroen Traction roadster and 1959 Chevy Impala and I well remember playing in abandoned cars - Mk 1 Zephyr, oval window Beetle and E Type Velox all providing hours of amusement, not to mention hood ornaments. Cars were much more exciting back then, even the neighbour’s humble new SL90 Viva in two tone blue. When the time finally came to learn to drive (waiting for that remains the longest 17 years of my life) I knew exactly what I wanted – a Volkswagen. Rejecting all manner of sensible things like A35s, A40s and an immaculate Simca 1501 for the same money I rushed out and bought the first Beetle I saw. It lasted about a week and was towed ignominiously away sparking a 30 year Wolfsburg Avoidance Policy – something I subconsciously followed even when buying our VW Camper as the T25s were built in Hanover! Probably, I shall never afford that Maserati Quattroporte or drophead Alvis from boyhood dreams but I have only managed about 18 months of my motoring career without a 1960s car of some sort. After all, it is the everyday stuff I remember the best and if ever my Euro-millions number does come up I shall buy one for each neighbour so that I can once again walk down a street populated by Victors, 1100s and Cortinas! Until then, our crusty, rusty but ever trusty Morris 1000 and Oxford will transport us in full 1960s atmosphere – authentically created by damp carpets and furred-up Smiths heaters of course! A trip with a neighbour to Beaulieu in 1980 to source parts for his 1935 Morris Eight sparked my interest in classic cars. We saw an advert there for a 1938 Austin Big Seven for ‘renovation’ and having ridden in one owned by a family friend in my boyhood ( and egged on by my neighbour), I couldn’t resist the temptation. So, couple of weeks later , ‘Betsy’ became one of the family and the following four year restoration took up most of my leisure time when I wasn’t travelling with my job. 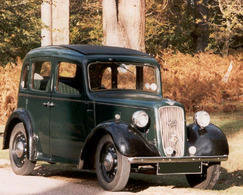 My first car had been a 1937 Austin 10 Cambridge at University and I’ve always had a soft spot for pre-war Austins. 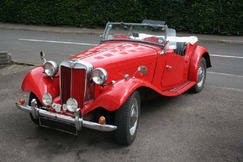 Betsy was joined in 1987, by a 1951 MG TD Mk II bought from a ‘friend of a friend’ in Louisiana. The Mk II was a special tuned version of the standard car and fairly rare especially in the UK. This one again needed a body-off restoration, but I managed this over the winter of 1977, and it took us all over Europe to the Alps the next summer. was frequently asked to ‘tune’ by its Bahamian owner. My other two cars were left back in the UK; the Austin was laid up in my friend’s barn whilst the TD was looked after by my son-in-law, a chief tech in the RAF. I got to drive the TD only on home leave for eleven years and only visited Betsy to start her up now and again. Since retiring and returning home in 2001, all three cars have been used extensively; in all I have done 18,000 miles in the Austin, 45,000 miles in the TD and 120,000 miles in the A! I would love another classic (a ‘54-59 Magnette really), but sadly lack of space and a threatened divorce has convinced me to shelve that idea. But watch this space! 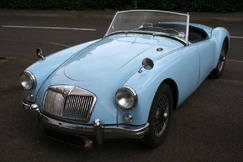 I have owned many classic cars over the years but my interest now focuses firmly on the Riley marque. I am lucky enough to have two. 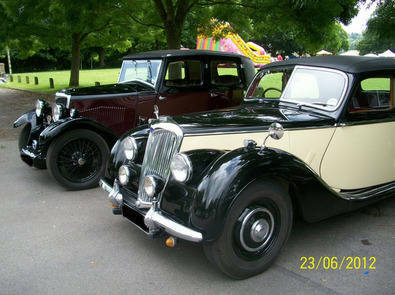 The first is a 1952 Riley RMA which I have owned for twenty three years and the second is a 1932 Riley Monaco, a much more recent acquisition. Before these two Rileys arrived on the scene I had owned a succession of MGB’s and two MGA’s, one of which I owned for seventeen years. For me though the Riley marque hits the spot perfectly. They are hand built quality cars which are not brash or ostentatious. My two cars, although very different, show clear family characteristics and it is interesting to see how the motor car progressed from 1932 to 1952. Body styles became much more streamlined although they share a similar engine design which when put in the Monaco was ahead of its time. The RMA is an easy car to live with, scoring well in terms of driveability. The Monaco, however, with its crash gearbox does take more practice. It is currently in the capable hands of Quentin Carmichael at his workshop in Braishfield as he is attending to some bodywork matters. I am looking forward to using both cars again this season and I am very pleased to be a member of TVME. I must attend some meetings! To be honest I knew little about Škodas. However, I was certainly tempted by my neighbour when he brought home his Škoda cabriolet. He enticed me further by gifting me a Škoda Owners Club GB membership and inviting me on a Škoda International Club Tour in Germany - 350 members and their cars from 9 countries all over Europe, with some 50 old cars, some dating back to the 1930s. It worked! The following year (2003) I bought myself this 1985 Škoda 130 Rapid. 'Tigger', my car's nickname, cost me £500. She failed her first MOT, so I spent out and had her welded, then outer sprayed in original colour and titivated the interior. Altogether I spent a small fortune, especially considering the value of the car at that time, however, when all is said and done it's my hobby and a price cannot be put on the pleasure I get from it. It's a bit of a faff getting the roof on/off; Velcro and snap fasteners galore - so when it's down it tends to stay down! Ironically this rapidly disappearing piece of iconic Czech engineering of the pre VW era has diminished dramatically since 2000, at which point 52,000 rear engine Škoda were registered. In 2014 it was 190, with certain variants in single figures. Škoda's roots were founded in 1895 by Vaclav Laurin and Vaclav Klement, who initially designed and built bicycles. The addition of engines to their bikes was soon followed by their first car. It was a roaring success and in order to build upon their success merged with Pizen Škodovka Co. in 1925 and became Škoda. Until the 1960s they were renowned for producing a handsome range of vehicles, yet in the years that followed the build quality was questionable. Although Škoda's reputation was tarnished, the rear-engined Rapid (1984-1990) was a significant improvement. The convertible was for the UK market alone and converted by Ludgate Design & Development. Of the 330 conversions there are now only 13 accounted for and 7 taxed on the road this year (in UK). The model used to convert into this cabriolet was the 130 Rapid Coupe later models the 136. The Škoda Rapid Coupe was built at Škoda's small Kvasiny factory from 1984 to 1990 with production ending in January of that year after some 33,455 units had been built. The Rapid model introduced engineering advances into the range including rack and pinion steering. Four pot callipers for the front discs brakes and at last a semi trailing arm suspension. Pricing was always a strong point in Škodas favour, the Rapid 136 Coupe in 1988 cost £4,200 and came complete with sun roof, stereo radio and tape player, and 5-speed gearbox and yet cost less than a mini. (Latest valuation £4,000). I think it is fair to say that Škodas have been the source of many jokes, so it's a shame that the heritage of Škoda, and certainly the stunning cars they once built, is not generally known. It's not the fastest thing on four wheels, but it sure does put a smile on my face!